Minford’s Brittani Wolfenbarker throws a runner out from her shortstop position during Tuesday’s 11-7 loss to Miami Trace. Minford catcher Kiersten Hale tags a runner out at home plate during Tuesday’s 11-7 loss to Miami Trace. Miami Trace shortstop Kaylee Hauck tags a runner out at second base during Tuesday’s 11-7 win at Minford. 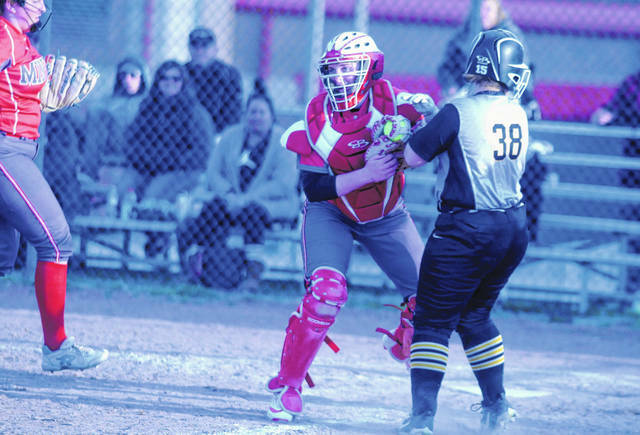 MINFORD — Anytime you score seven runs with two capable pitchers in the circle, you’re going to have a chance to win a ballgame. But when Miami Trace is hitting like it was Tuesday night, those chances significantly decline. 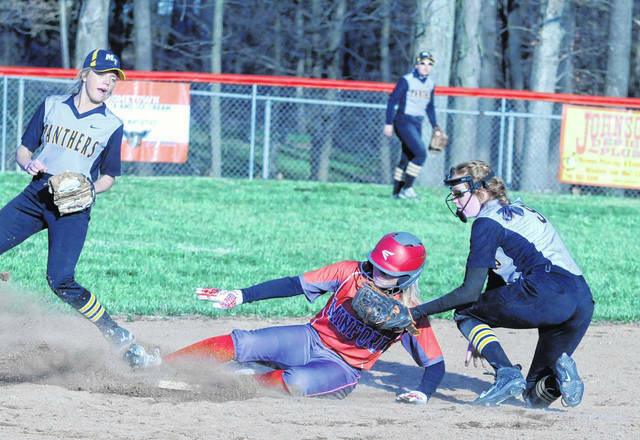 The Panthers (3-0) slugged out nine hits, five for extra bases, to beat Minford in a non-conference contest. Miami Trace hit three home runs, accounting for seven total runs. 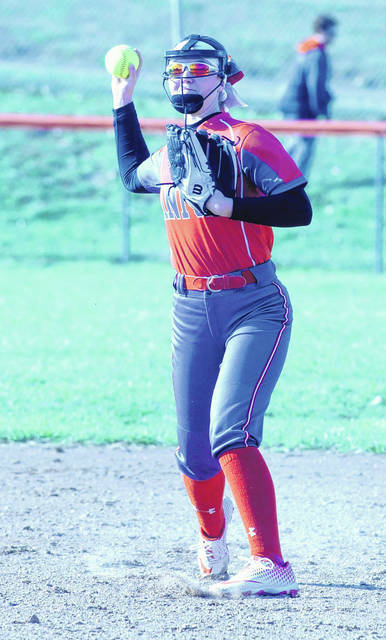 Miami Trace’s pesky lineup, one through nine, struck out just three times while constantly putting the ball in play and keeping Minford’s defense on its heels. Senior catcher Jessica Camp hit a first inning home run and followed it up with a two-run bomb in the third to lead the charge. After the Falcons (4-3) chose to intentionally walk Camp in the fourth, loading the bases, Miami Trace’s Ashley Campbell teed off on the next pitch she saw, extending the lead to 9-2. However, Minford didn’t hang their heads. Instead, the Falcons chose to fight back. In the bottom half of the fourth, Madi Sifford launched a solo home run over the left field fence before Tamara Burchett lined a two-run double into outfield grass. In between those two hits were two additional runs as Minford cut a five-run lead to 9-7 heading into the sixth. Unfortunately for the Falcons, Miami Trace’s Olivia Wolfe mowed down the last six hitters she faced in order to seal the deal. Wolfe got the win in the circle, throwing all seven innings while allowing 12 hits and striking out nine. Minford’s Hannah Tolle took the loss, throwing four innings and surrendering five hits. At the plate for Miami Trace, Camp was 3-for-4 with two homers and three RBIs while Campbell finished 2-for-4 with a double, a home run and four RBIs. For the Falcons, Tolle went 2-for-4 with a home run and two RBIs, Burchett was 2-for-4 with two doubles and two RBIs, Maddie Slusher was 2-for-3 with a double, and Brittani Wolfenbarker finished 2-for-3 with a run and a walk. The Falcons get back to action Wednesday night at Valley before traveling to Northwest on Friday.